Combine 2 quarts (8 cups) Savory Poultry Gravy, chicken and thawed peas and carrots. Cover and refrigerate remaining gravy. Pour sauce mixture over cooked pasta and stir gently to combine. Divide mixture evenly between two 2½” deep half pans. 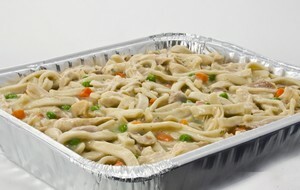 Cover pans and bake until internal temperature of product reaches 165° F. Begin to check temperature of product after 30 minutes in oven.